Mattresses: Too Big and Complex to be Biodegradable? 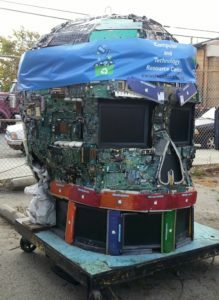 Reducing waste of any kind, whether it be e-waste or home goods, protects and preserves the environment for the future. It cuts down on the carbon footprint and prevents the overuse of natural resources. E-waste recycling protects and prevents harmful substances from leaching into the environment, but it’s not the only kind of waste that can cause significant environmental problems. Nearly 8,000 mattresses enter landfills every day. A typical bed is difficult to compact, clogs equipment, and creates soft spots full of materials that don’t break down over time. However, there are mattresses available that are made of 95 percent biodegradable materials. Biodegradable mattresses are good for the environment and human health. To be biodegradable, a mattress must be made of natural or organic materials. Of the mattress options on the market, natural latex mattresses are the most eco-friendly and biodegradable. Made from the sap of the rubber tree, the latex used in these mattresses must go through one of two manufacturing processes, Dunlop and Talalay. The Dunlop manufacturing process creates a dense, durable latex that makes a firm mattress. This process results in a natural sediment that settles to the bottom layer, leaving one side of the mattress firmer than the other. Because the Dunlop process is relatively simple, it’s more environmentally friendly and uses fewer resources to make the mattress than the Talalay process. It’s also the less expensive choice between the two. The Talalay process produces a lighter, springier mattress. They work well for those who want a breathable, biodegradable option. However, Talalay mattresses are more expensive because of a complex, labor-intensive manufacturing process. They’re also less durable and wear out faster than Dunlop mattresses because of the airy texture of the latex. Whether the Dunlop or Talalay process is used, all natural latex mattresses include some synthetic latex, which is derived from petrochemicals. Synthetics account for anywhere from 5 to 40 percent of a natural latex mattress. It’s important to note that when talking about a “biodegradable” mattress, the biodegradability is relative. Compared to other mattresses, natural latex mattress will most certainly break down over time. However, there will be some residue left behind. They’re not like food or other organic products that will completely disappear in a few years time. Latex mattresses are amongst the most expensive mattresses on the market. To meet the demand for an eco-friendly choice as well as to meet the preferences and comfort needs of consumers, some manufacturers have begun to develop hybrid models that use Dunlop latex for the inner core and Talalay latex for the comfort layers. Traditionalists might enjoy an innerspring/latex hybrid that provides the feel of an innerspring mattress with the sustainable, more eco-friendly latex comfort layer. While these options aren’t perfect, they certainly provide mattresses that take the long-term life of the bed into consideration. Preventing harmful materials from sitting in landfills falls onto the shoulders of consumers. Whether it’s responsibly disposing of e-waste or a mattress, used items have to be reused or recycled if future generations are to be able to enjoy the natural environment. Purchase power gives consumers the advantage of making demands on manufacturers. When it comes to the mattress industry, manufacturers have started to listen. They’re still researching manufacturing processes that will result in a 100 percent biodegradable mattress. As the search continues, consumers can continue to dispose of mattresses responsibly and make smart purchasing decisions.